Sony is working hard today to bring the PlayStation brand to mobile devices. They began work last year, when Sony announced the PlayStation Suite, a program that will bring games to Android devices PS Sony, and also allows other manufacturers to bring gaming to devices other than Sony's PlayStation. 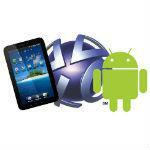 Currently the Xperia Play, and Sony is a tablet device that has the ability to play PlayStation games officially. When the Sony keynote at E3 gaming expo, Sony announced that PlayStation Suite will be renamed the PlayStation Mobile, but this product will still offer the same service that is licensed PlayStation Android device. Even more interestingly, Sony revealed that the first partner for the products of PlayStation Mobile is HTC. There is no specific information which the device or what is referred to in the announcement, but it was a major step taken by Sony. HTC has been known as a qualified manufacturer in producing high quality devices, and certainly would be better if accompanied with PlayStation capability.